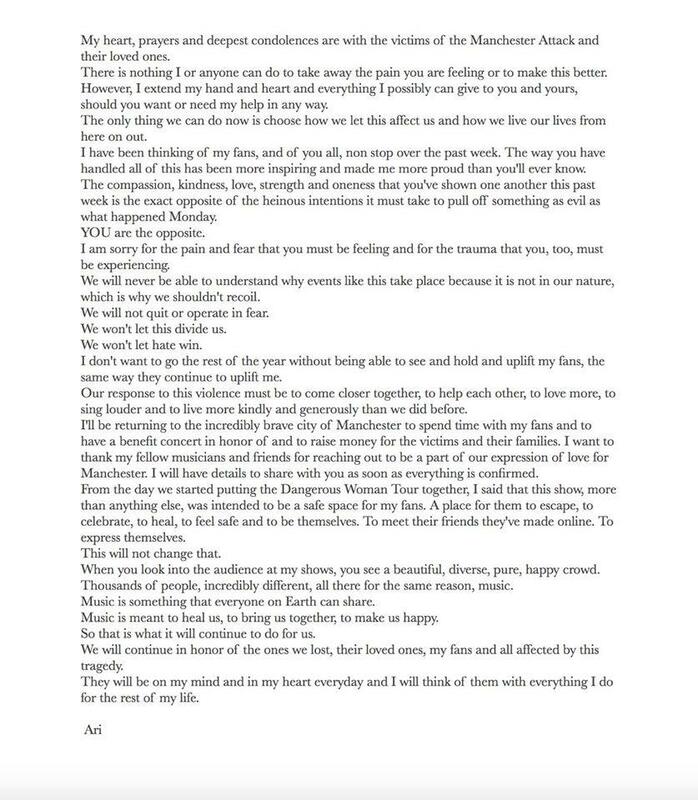 A few hours ago, Ariana Grande posted a message on her verified Instagram/Facebook page, sending her deepest sympathies to the victim’s families of the May 22nd bomb blast at Manchester Arena, Manchester. In the post Ariana admitted, that there is nothing that she can do to take away the pain..for the victim’s families.But she said, she will do anything to make the pain go away..any help the victim’s families might need (perhaps she is referring to counselling, setting up a charity to support the victim’s families etc). She also thanked her fans, for the way they handled this disaster, with unity, calmness, composure, love and kindness… by not hurting the sentiments of people belonging to a specific religion (of the suicide bomber), which frequently happens in the U.S these days. Referring to the heinous act committed by an evil organization, Ariana thanked her fans by taking revenge on that organization by using the weapons of love, sympathy, empathy, oneness and unity. She once again apologized for the trauma caused by her Manchester Arena, concert on the 22nd of May 2017 and said, that she will never be able to understand this strange act of terror by mother nature or destiny during her concert but said it’s time to move on. At this point, many of her fans..seem to be really worried about Ariana Grande’s state of mind…as she has apologized many times in her message, for something she was not responsible for. Grande added that she will be returning to Manchester very soon for a benefit concert, to raise funds for the victim’s families and she will be thinking of each and every one of them (victims) for the rest of her life. The only thing we can do now is choose how we let this affect us and how we live our lives from here on out.I have been thinking of my fans, and of you all, non stop over the past week. The way you have handled all of this has been more inspiring and made me more proud than you’ll ever know. The compassion, kindness, love, strength, and oneness that you’ve shown one another this past week is the exact opposite of the heinous intentions it must take to pull off something as evil as what happened Monday. YOU are the opposite.I am sorry for the pain and fear that you must be feeding and for the trauma that you, too, must be experiencing. We will never be able to understand why events like this take place because it is not in our nature, which is why we shouldn’t recoil.We will not quit or operate in fear. We won’t let this divide us.We won’t let hate win.I don’t want to go the rest of the year without being able to see and hold and uplift my fans, the same way they continue to uplift me. I’ll be returning to the incredibly brave city of Manchester to spend time with my fans and to have a benefit concert in honor of and to raise money for the victims and their families. I want to thank my fellow musicians and friends for reaching out to be a part of our expression of love for Manchester. I will have details to share with you as soon as everything is confirmed. From the day we started putting the Dangerous Woman Tour together, I said that this show, more than anything else, was intended to be a safe space for my fans. A place for them to escape, to celebrate, to heal, to feel safe and to be themselves. To meet their friends they’ve made online. To express themselves.This will not change that.When you look into the audience at my shows, you see a beautiful, diverse, pure, happy crowd. Thousands of people, incredibly different, all there for the same reason, music.Music is something that everyone on Earth can share.Music is meant to heal us, to bring us together, to make us happy.So that is what it will continue to do for us.